A year ago today was my last full day of work with Verizon. After twenty-one years with the company, God had decided it was time for me to go in a new direction. And what a completely different direction it was! 2018 also saw me be ordained by my home church (Relevant Church) in Tampa, and had me mourning the passing of my aunt in Miami and my uncle in Puebla, Mexico. Lee and I were also blessed to be able to come home in September for her nephew’s wedding and to catch up with family and friends. But then things went proverbially sideways with our mission life in the D.R., and after much soul-searching and wrestling with God, we made the decision to resign and come home. It was four weeks ago today we boarded a flight to come back to the States. It’s been a whirlwind, to say the least, since we’ve returned. Reconnecting with family and friends has been good for our souls, and there is the deilghtful, romantic notion of living like gypsies, bouncing among AirBNB’s and guest rooms at friends’ homes. But my heart still hurts from experiencing a dream die and having to say goodbye to so many people that I came to love so much. Having stepped out in obedience by selling everything and going into the mission field has us now in a very unique place to be very flexible for whatever – and wherever – God has in store for us. We don’t know what that is. Lee and I are praying an opportunity in ministry will present itself, but as of right now we remain proverbially homeless and unemployed. Still, we know God will provide as He did through every day and every event of this past year. We are not worried. We are not panicked. We are confident because we worship a faithful and loving God. And as I mentioned in the closing of my Facebook post from last year: God is Great! My wife and I make a great team. In many ways, we’re perfect together. But if there’s one thing we’re not, it’s financially savvy. Neither one of us was raised by parents who invested in the market or had that innate sense of entrepreneurship. Rather, we both come from poor, blue/no collar backgrounds where frugality is an art form. As a result, we did a poor job of staying financially healthy. Even though we were blessed with steady careers that yielded wonderful salaries, our mistakes from the past left us living paycheck to paycheck with little, if any, security net on which to fall. So it’s no understatement when I say the best thing to happen to me was being laid off. At the time I received the notification, I was left in shock. But less than two weeks later, God revealed part of his plan for Lee and me, and we’ve been moving in a bold, new direction ever since. Part of this new direction has been the ability to take my severance check from Verizon and use it to pay down and eliminate some of the debt in which we’ve been drowning. The check has been a metaphorical ladder we’ve used to climb out of the hole we dug over the last ten years. Needless to say, I spent most of this morning going through our accounts and paying off debt after debt after debt. The euphoria of seeing the hefty balance in our checking account was quickly tempered by the realization those dollars would soon be gone. Look at all this money ….. and it’s gone. Dave Ramsey reminds us that money is a tool. Although it would leave as quickly as it came in, this severance check was a tool God gifted us so we can be better positioned to transition into mission work. There’s no doubt in my mind had I not lost my job, we’d still be buried in debt in 2019, the date I was originally targeting to leave my career. They say God doesn’t call the qualified, He qualifies the called. In the case of this money, it was simply part of the continued qualification God’s putting us through in preparation to do His work. And you can’t put a price tag on that. I was not a fan of the Senior Manager to whom I reported while at Verizon, and it’s not simply because he chose to lay me off. Rather, it’s because I never felt he came across as a genuine person. From the moment he took over our group (January 2017), he was never genuinely interested in me or my team or what it is that we did. Instead, my readout of his style and approach is that of a glory-seeker looking to do what he can for the next advancement up the corporate ladder. Unfortunately, when you work in I.T. you see this a lot, and this personality trait is not unique to members of management from this continent. That being said, what really irritates me is the new information I received regarding a conversation this Senior Manager and I had back in September. I need to preface by saying I was notified (by my immediate Manager at the time) of my layoff in mid-November, and my last day on the Verizon payroll was the end of December. Still, it was back in September that I last spoke to my Senior Manager, and from what I just learned, the conversation was most likely not by choice. His phone call came as I, and many of my peers in the Tampa Bay area, was preparing for Hurricane Irma. Amidst the chaos of buying water, boarding windows, and making contingency plans, my Senior Manager called to “see how I was doing.” From the get-go I could tell there was nothing sincere in his voice. He asked simple yet mundane questions about the preparations, and I remember thinking what a waste of time the conversation was given he and I didn’t have any kind of relationship outside of work. Not once in the short time I reported to him did he ever make the time to talk to me about me, or ask me about my family, or pick my brain about work stuff. Rather, he came in, threw his weight around, and called me only when he needed something done for him. For him to suddenly be concerned with my well-being felt like a farce. It turns out managers within Verizon received a memo instructing them to reach out to their employees impacted by the impending storm. Basically, Verizon sent out a memo telling its managers to act like human beings. This is just one of the reasons I am so happy I was impacted by last year’s reduction-in-force (RIF) at Verizon. The company at which I started twenty years ago has morphed into a myopic behemoth that cares almost exclusively about the bottom line and very little about its employees. The fact people need to be instructed to act with decency and genuine humanity means I got out at just the right time. I thought I was doing well with my month of discipline, and from a diet and ‘time with God’ perspective I have been. But today has been severely aggravating as I’ve spent over two hours collectively on the phone with Verizon technical support. 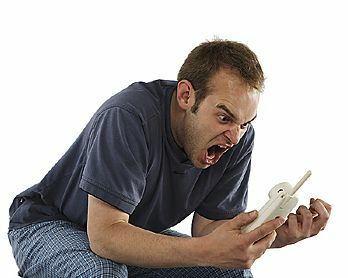 My issue with my video service upgrade is still not resolved (even though we got to a point where we thought it was), and my frustration boiled over with the last tech support representative with whom I spoke. Although I was not mean to that person, I was stern, the volume in my voice well above average, and my increasing loss of patience evident to the person on the other end of the line. The call ended – problem still not resolved, technician coming out on Tuesday – and my daughter called me out. She called me out for letting the whole situation get to me. She called me out for not taking a breath and trying to relax through it all. She called me out for not handling the situation better (i.e. with more grace). Did I mention she’s only fifteen? And she’s right. Through it all, not once did I think to slow down and pray. Not once did I remind myself it’s not the fault of the tech support rep that my video service isn’t working. All I could think of was the amount of money I pay per month for this t0 not be working, and how I was missing the Final Four. In that moment, I needed serenity, and I completely failed (and set a bad example in the process). I came to my laptop to post my blog for tonight before heading out to the movies with the kids. 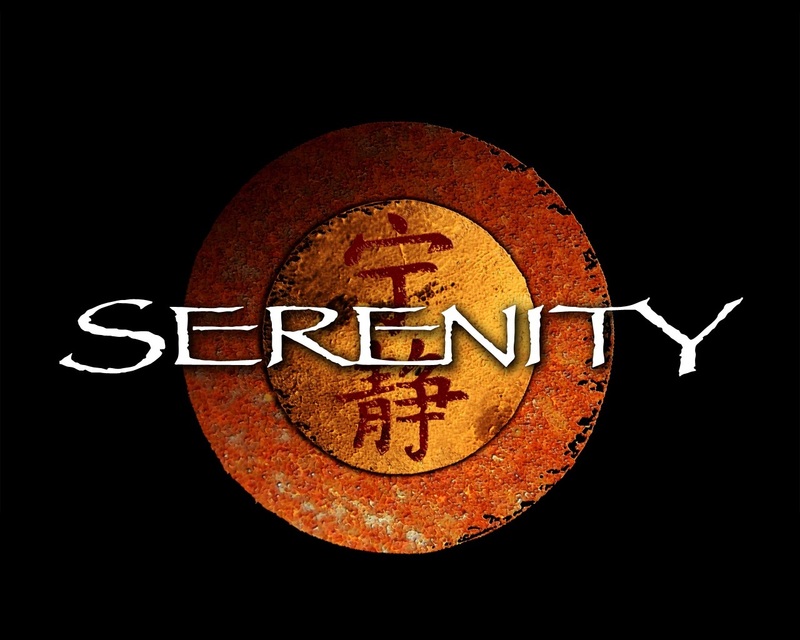 The wallpaper on my laptop is this image from the TV show Firefly. It’s funny that for as often as I see it, or for how intentional I try to be, it’s so easy to lose sight of that reminder; find your serenity. Yet another lesson to be learned on my part. I am a tech geek. I love technology and all the wonderful and efficient things you can do with it. I love technology … right up until the point it doesn’t work. I accept the occasional glitch and hiccup, but when A + B = C and you do A, then add B, and you get Z; that’s when I tend to lose my mind. Enter my recent upgrade to FiOS Quantum, the premium level TV and Internet offering from Verizon. I’ve loved FiOS since it was launched, and for the most part the product has been great. With Quantum, my three separate DVR’s are replaced by one media server that has more than double the capacity than I previously had, and can record six programs at once. In addition, it makes every TV in the house operate the same (pause live TV, access DVR, etc.) Previously, the TV’s in my kids’ rooms had only standard set-top boxes. So I receive the new hardware, set it all up, and ….. my Internet is working. A not-so-quick call to customer support and the problem is resolved. I move on to the media server setup and …. my premium channels aren’t working. Not that big of a deal, but still a problem that needs to be resolved. Back to customer support. The resolution was Verizon sending me a new media server (it was a hardware issue). I unpackage the new device, connect it to my TV, and …… I run into another problem. Back to customer support. By this point, I would normally be yelling and/or speaking very condescendingly to the poor soul on the other end of the line. My frustration is not with them, but rather with the fact the darn thing I expect to work isn’t working. I would also be reaching for a beer to help me calm down, with the bonus of having something to throw in case the issue goes really, really bad. This behavior, however, does not align with my personal month of discipline. More importantly, this behavior does not align with my life as a Christ follower. That’s not to say Christians never get angry. Even Jesus went a little ape doodoo when he saw the temple turned into a marketplace. But the lesson with my recent frustrations is patience. It’s also a reminder that God uses situations like this to mold us into better people. I’ve asked God to help make me a better man, and this is a trial He is using to do so. I am proud to say my conversations with each of the tech support representatives with whom I spoke were cordial and constructive. Well … I did end up hanging up on one rep who was, for lack of a better phrase, clueless. I look back on that, however, knowing I should have handled it better, and that it is all part of the learning and growing process. You can’t walk a thousand miles and not have sore feet. You can’t get from here to there without some bumps along the way. The next time you feel you’re having a “poop has hit the fan” kinda day, ask yourself if perhaps God is challenging you to grow in that moment. Of course, I may have read the letter incorrectly. 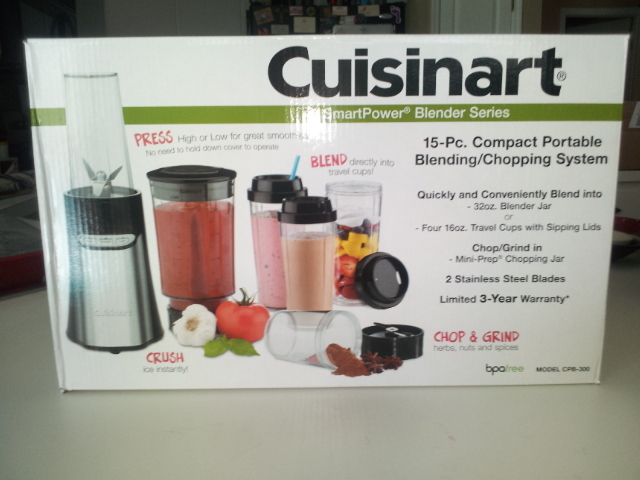 On the plus side; free blender. I came home from dropping off the kids at their mom’s house, and as I pulled into my driveway and stepped out of my truck, I heard a rumbling in the air. 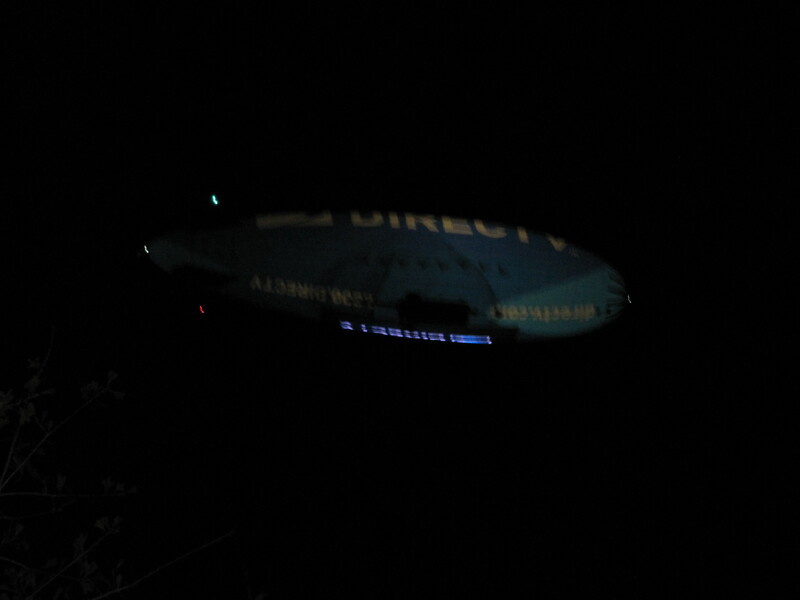 I looked up to see this scene out of a science fiction movie: a slow moving object with shiny blue lights. Try as they may, there’s no way I’m getting rid of my Verizon FiOS.